Great way to transform an existing pillow to a seasonal one! Design is on both sides! Covered my well used sofa pillows with these new Cardinal covers. They look very nice on my sofa. The red Cardinal is cheerful and reflects my love for birds. Love the zipper closing. Can't find anything I dislike about them (I bought two.). Wanted to make sure it fit my current pillows, so only bought one. When I went back to order another it was no longer available. The design is beautiful and the quality is excellent. Every visitor has admired it and the other two pillow cover designs that I purchased. This one is my favorite. I hope that pillow covers like this one will be available in a variety of designs for other holidays. Very attractive well made pillow. Zipper closure hidden so well hard to see it. I intend to use it year around. Cardinals are a bird that are also year around birds. My Mother loves her pillow (cover). It is very well made and there isn't just one part that looks good and the rest isn't great. The whole thing is really nice, which was a pleasant surprise. Nice colors, composition, well made. 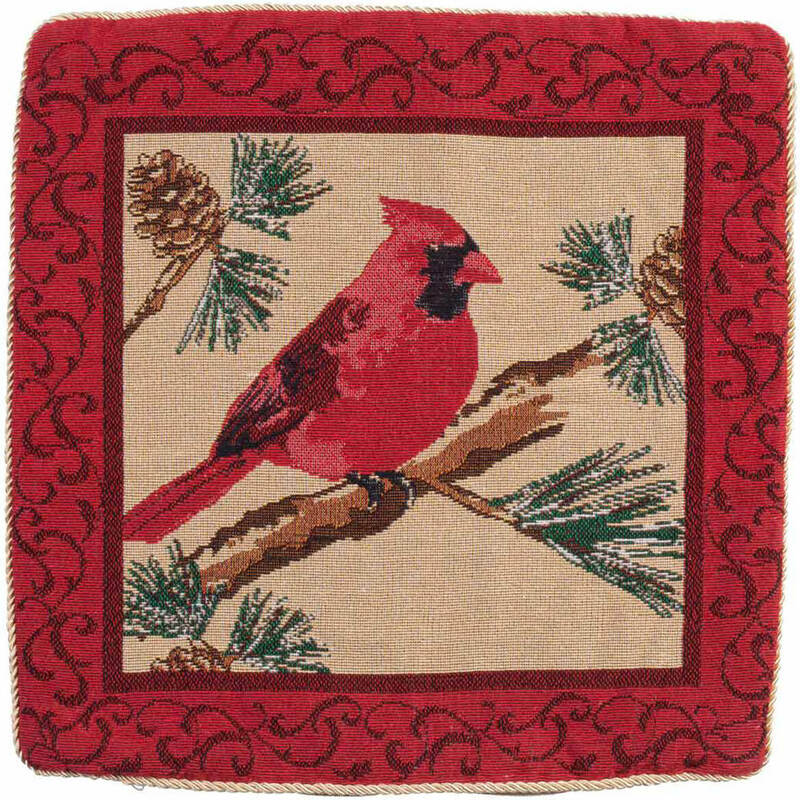 Re Cardinal Pillow cover - bought a pair as a gift. Nice quality, colors were perfect. Could be used during the holiday or all winter. only good things to say about these pillows. Even the sofa celebrates Christmas! Extremely attractive covers! The gold braid edging adds an impressive "frame" for these cheerful, colorful cases. I used them for home decoration and for a gift for a cardinal-loving friend. I purchased the pillow cover for a hostess gift. Was pleased to find the design was on both sides of the cover. 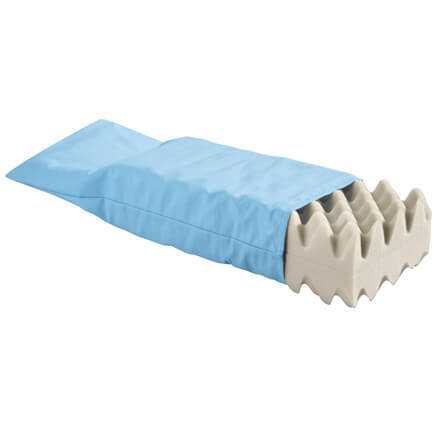 I think it is a quality product and the price was super! This looks like an expensive pillow cover. It is very well done and the colors and design are just beautiful. Love Went back for two more after I received the first one. During the 'cold' weather months to change out the look of the throw pillows around the house. 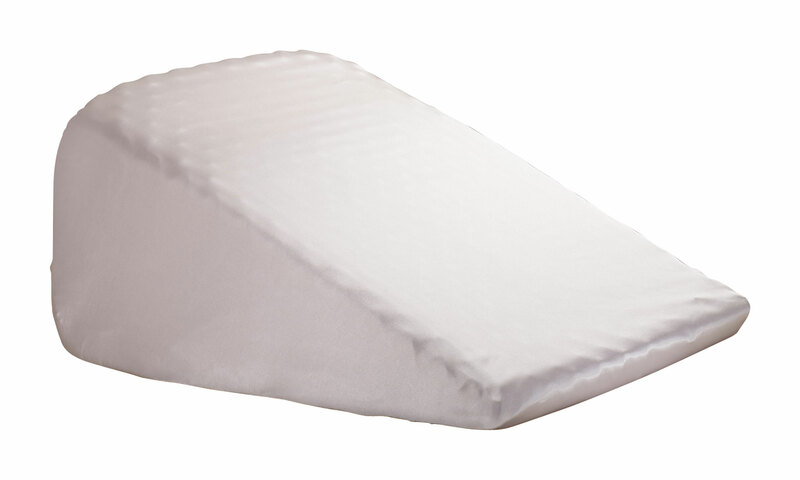 Miles Kimball's pillow covers are top quality for price. I haven't had any problems with pillow covers. I actually bought 3 of this design. It is reversible and just gorgeous! Great seasonal embellishment! Perfect addition to my couch during the holidays, and I don't have to find a place to store my other pillows when I'm using the cover! I can't wait to use ithem! 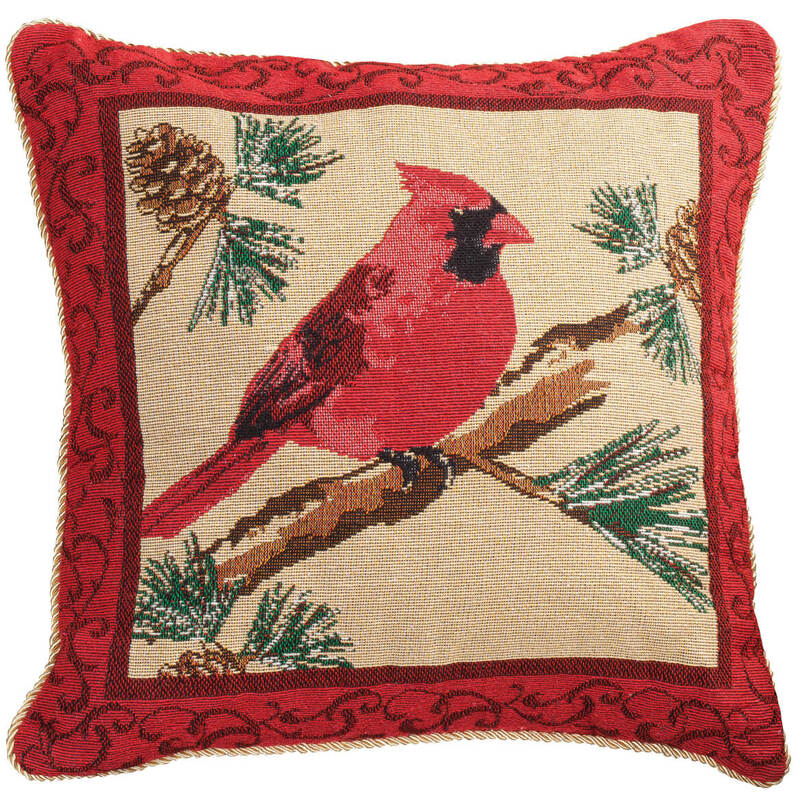 After Thanksgiving I'll replace the pumpkin pillow covers I purchased with these new Cardinal covers. That will take me to next spring! These Christmas pillow covers are very nice, good quality product. they fit over my pillows perfectly. I cover the pillows I have on my couch at christmas. I can then pack it away with the christmas decorations. I have been trying to find decorative pillow covers for a long time, without success until I saw these. I wish they also had a more year round design. They are a little too big for the pillows whose covers have worn out and I had to take a tuck. But the measurements were correct, and I expected that problem. They appear to be well made. I love anything with Cardinals and this looks really amazing. Can't wait to put it on my bed! 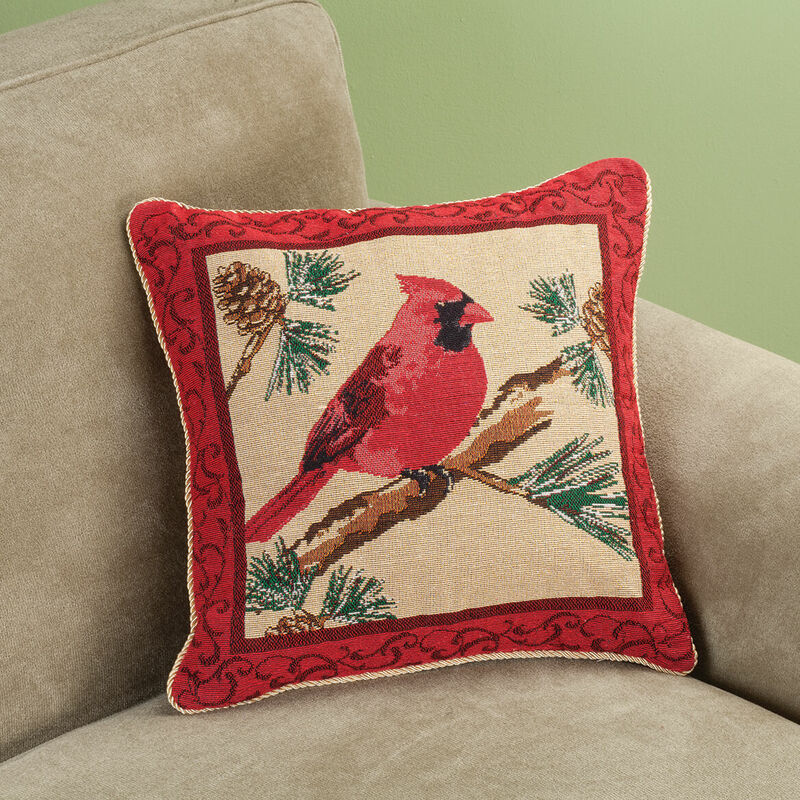 need two pillows on couch and I like cardinals and i liked the color..
Makes me think about heaven. My wife wanted to dress up our sofa and to bring some joy during the darkness of winter. Festive for Christmas; great to use all winter. I have lots of cardinals on my Christmas tree. Thought it would be a nice accent. We bought two and love them! Great quality! Looks like good quality and I love cardinals. Use Cardinals for Christmas decorations. Received good reviews, so I will give them a try. Do hope they are red not pink or orange. 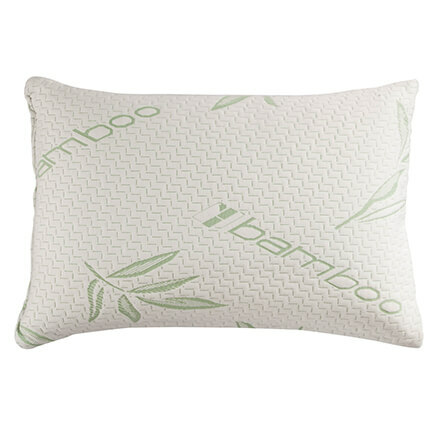 Beautiful design which will fit over my other pillows. Red bird is my favorite. We have a feeder in our yard & enjoy year-round. Will keep pillows out year round as well. Redoing my house and this will look good for Christmas. Decoration pillow for the chair in my breezeway. This size fits a pillow I already have so I just switch out the covers for the different seasons. Love these covers. Had lots off pillows that matched my sofa so putting these on was easy and they look great for the holidays!!!!!!!!!!!!!!! The cardinal has been a special blessing in my life. I chose this pillow cover because it is not seasonal. Love cardinals! Very attractive cushion cover! I have bought pillows before and they are always very, very beautiful. My mother loves cardinals. 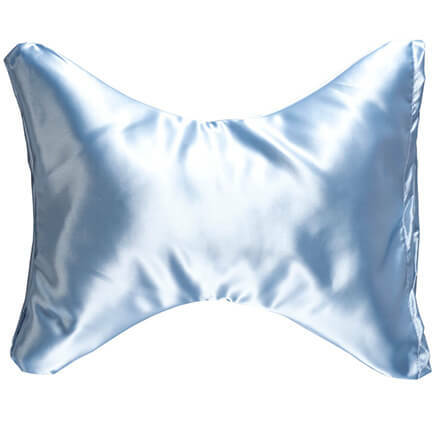 She has Alzheimers and I hope this bright pillow will bring her some kind of pleasure- she no longers speaks or interact with anyone. She just sits there day after day. Maybe this will remind her of times long ago. Because my Christmas decorating theme is Woodlands and Cardinals. I have two of these. I just cover my existing coach pillows and they look just beautiful! Nice Christmas decoration without having to store a bulky pillow. It's beautiful,& needed winter pillow covers. Cardinal lover. They can be crazy, but they are colorful. how do you measure? From corner to corner? horizontal or vertical? BEST ANSWER: if I remember correctly I did corner to corner but if you like when I get home tonight I'll be glad to measure the pillow and see what it comes out to be? by the way love the covers! I found some in the new catalog for St. Pattys and Easter that I plan on ordering. my mom doesn't have a lot of storage space so its perfect for her too! Across and lengthwise , corner to corner . I love these pillows ! I just bought inexpensive insert pillows of the same size or an inch smaller and inserted him them . You can make your own insert pillows too. Just make the same measurements out of cotton and fill with filling . 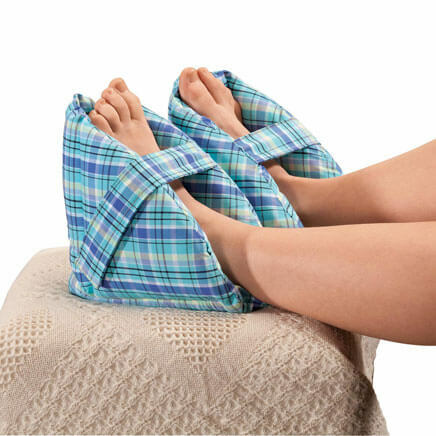 These covers are washable too . Fun for the holidays. Thank you for your question. The measurements are side to side. We hope this information will be of help to you. Corner to corner gives me 17-18". Best method! will this fit a 14" pillow? BEST ANSWER: Thank you for your question. This is for an 18x18 inch pillow so it will be big for the 14 inch. We hope this information will be of help to you.